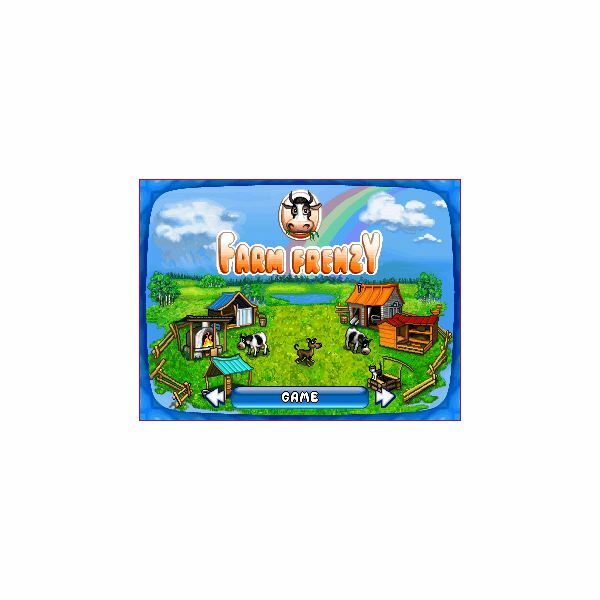 Farm Frenzy, in its most basic form, is a fast-paced game of resource management. You take the role of an unseen farmer, and you have to manage your group of animals through 48 levels of arcade-style action. While the game wasn’t developed with mobile technology in mind, Farm Frenzy Mobile transfers well to the format and plays decently on a small screen. This review is specific to non-touchscreen BlackBerry devices, although the game should be similar on any other non-touchscreen phone. Farm Frenzy Mobile’s levels are laid out on a virtual farm, and you only have access to one level to start the game. As you progress, the levels occasionally branch out, but your overall advancement into more difficult levels is linear. Each level has a goal that you need to meet in order to pass the level, and two different time benchmarks. If you complete the goal under the first benchmark, you get a gold medal and some extra coin, if your time is in under the second benchmark, you get a silver medal and a little less coin. If you take longer than both time benchmarks, you still pass the level, but you just get a checkmark. This rated system is the key to Farm Frenzy’s replay value. You start each level with a certain amount of cash and a certain number of animals. You have to keep the grass watered to keep your animals alive, and you have to harvest the goods that the animals produce. As you progress you can purchase buildings, which will upgrade some of the produced goods into higher quality items. When you need some money, simply put the goods on the truck and a few seconds later the truck returns with your cash. Life isn’t always easy so the game designers added a few wrinkles to give the game an arcade-style feel. Once a good is produced, you only have a few seconds to harvest it, or it goes away. This goes for goods produced by animals or buildings, even those whose icon might be hidden by a grazing animal. You learn early on to click on the warehouse a lot, just in case there is a good you cannot see. The other hindrance is the bears. Every once in a while a few bears will drop down out of the sky. If a bear touches one of your animals, it gets destroyed. Luckily, you can click several times on a teddy bear icon near the top of the screen to cage the bear, and then you can even sell the caged bear for profit. You start each level in Farm Frenzy Mobile with a set amount of money, animals and buildings. Since every animal and building takes a set amount of time to produce a good, other than the bears there really isn’t much that is random about Farm Frenzy. This means that for every level there is a correct build order to maximize your production and get through the level fast. What’s even more amazing, is that for such a simple game, the best build order seems to be different for each level, so unlike many resource management games, the first two minutes of every level are not necessarily the same. The strategy progression on the game is good too. In the beginning of the game the build orders are fairly straightforward, but it gets much more complicated as you progress. Soon you will find yourself weighing the benefits of adding another chicken against buying more space in your warehouse. The unavoidable low point for a PC game that is ported to a mobile device is always the controls. Farm Frenzy’s game designers added hotkeys to many of the major parts of the game screen, so getting around the game is a little easier, but a few of the buildings and menus on the screen don’t have a hotkey, and getting to them is sometimes a chore. The cursor didn’t always move when I wanted it too, and I occasionally overshot the building I was going for. BlackBerry trackballs aren’t known for being amazing, but the difficulty here is more than just hardware related. Because of the havoc the bears create, your cursor will automatically move to the teddy bear when the bears drop into the game. This isn’t an issue unless you were in the process of moving the cursor, and you inadvertently move it off right after it jumps. Getting the cursor back on the teddy bear before your farm is destroyed can be an exercise in frustration. On a non-gameplay note, moving the cursor on the level select screen is extremely difficult. It took a lot of scrolling to go back and play previous levels. On a BlackBerry device, Farm Frenzy Mobile’s graphics are alright, but nothing to get too excited about. There isn’t much room on a mobile device to work with, but most of the animals and icons are distinguishable. The different buildings have different colored roofs and a slightly different design, but it is a little hard to remember which color makes which item, so a little more customization there would have been nice. The sound is, honestly, not very good. I tried to play the game with it on for a while, but ended up turning it off. Not a deal breaker, by any means, but the music and sound could have been much better. If 48 levels aren’t enough farm action for you, Farm Frenzy’s level rating system will have you going back for more. Your performance on each level is either rated gold, silver or with a check mark, and the results are displayed on the game map. When you finish the game, the first thing you want to do is go back and turn all your levels to gold. You can also upload your score to see how you compare against players around the world. This version of the Farm Frenzy game also has 16 different achievement award that you can get for everything from getting 1,000,000 coins to catching 100 bears. Between the level medals and the achievements, there are plenty of reasons to continue to play the game once you have gone through the 48 levels. Let’s not kid ourselves here, Farm Frenzy Mobile isn’t going to make any all-time best game lists. What it is going to do, however, is give you more than a few hours of enjoyment that you can play a few minutes at a time, which is especially good if you will be playing it on the move with your BlackBerry. Now, if you don’t like resource management games, or you don’t like real time action, you might not find the game as enjoyable as I did, but the concept is solid and the game plays well on a mobile device. The few glitches with the controls and the music don’t really take much away from an otherwise great mobile gaming experience.